Special Containment Procedures: Each instance of SCP-1120 is to be contained in a standard-size containment cell in the B500-B600 cell block of Containment Area-56. The bricks comprising the walls, ceiling and floor of the cells are to be constructed from a mixture of three parts ground human bone to two parts industrial cement. One armed guard is to be posted to every group of five cells in the block. In the event that SCP-1120 becomes active and breaches containment, personnel are advised to implement Procedure SCP-1120-Epsilon. Under no circumstances should a living human being be permitted to touch an instance of SCP-1120. At the time of this writing, all one hundred (100) known instances of SCP-1120 are in Foundation custody. However, in the likely event that a museum exhibition featuring one or more instances of SCP-1120 is discovered, all instances of SCP-1120 are to be immediately acquired and replaced with plaster replicas. If this is not possible, one or more members of MTF-Delta-6 “Vestal Virgins” are tasked with integrating themselves into museum staff, maintaining surveillance, and preventing the creation of instances of SCP-1120-1 by whatever means necessary. All new instances of SCP-1120-1 are to be treated as instances of SCP-1120 and contained accordingly. 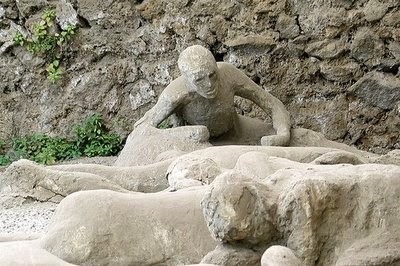 Description: SCP-1120 is the collective name for a number of human skeletons encased in what appears to be pyroclastic igneous rock. 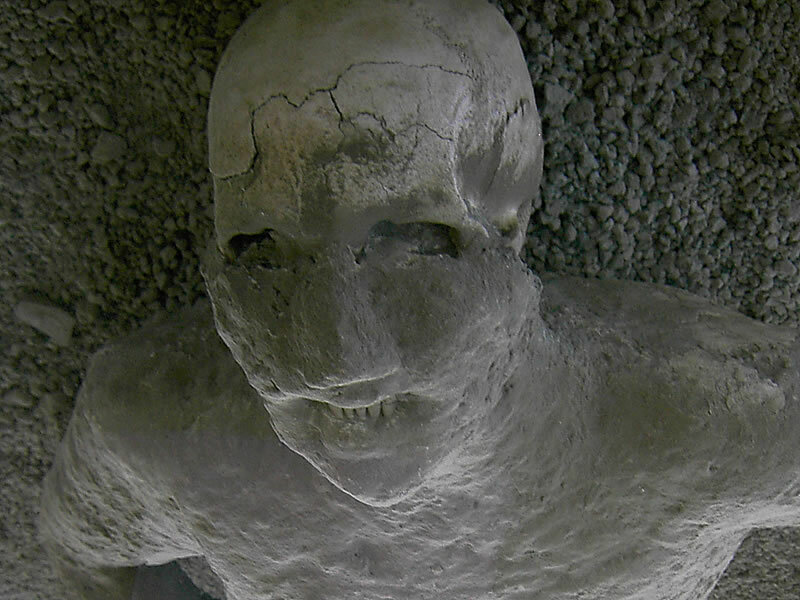 Although exposed bone may be shattered and destroyed by conventional means, the epidermal rock layer encasing SCP-1120 has been shown to be incredibly resistant to damage. It is believed that this is a property of SCP-1120 rather than the rock itself, as rock samples appear to lose their anomalous properties once removed from SCP-1120. Laboratory tests on epidermal stone fragments removed from SCP-1120 have identified tephric matrix substructure consistent with that of non-anomalous ignimbrites, though whether or not this accurately reflects the internal petrology of SCP-1120 is unknown. Instances of SCP-1120 vary in a manner consistent with human stature. Most ages and genders appear to be represented; several instances of SCP-1120 are approximately the size of prepubescent human children. Instances of SCP-1120 are animate, though whether they are sapient has yet to be determined. At the current time, all instances of SCP-1120 are in a dormant state. It is not known what will cause them to become active, as this has only occurred ██ times since their entry into Foundation custody. Upon entering an active state, an instance of SCP-1120 will patrol the surrounding area and attempt to seek out a living human subject. If SCP-1120 locates a suitable human subject, SCP-1120 will immediately charge and attempt to grab the subject. Instances of SCP-1120 exhibit inhuman strength, and have been observed to break through cinderblock walls and destroy sizable pieces of urban infrastructure while in pursuit. However, pursuit is not singular: upon spotting another, closer subject, SCP-1120 will adjust its course in order to pursue the more proximal target. Coordinated personnel teams can easily exploit this fact to 'herd' instances of SCP-1120 into appropriately designated containment facilities (a process referred to in documentation as Procedure 1120-Epsilon). If any part of a subject's skin comes into contact with SCP-1120, SCP-1120 will immediately cease pursuit. Upon contact, the subject, hereafter referred to as SCP-1120-1, will enter a state of paralysis, remaining frozen in the position in which they were last touched by SCP-1120. The instance of SCP-1120 that initiated contact will assume a supine position and return to a dormant state. Over the course of the next three minutes, all skin, muscle and organ tissue belonging to SCP-1120-1 will transmute into igneous rock, beginning with the soles of the feet and ending with the crown of the head. The process is assumed to be extremely painful- scans of subjects undergoing transformation have indicated immense nerve damage and severe internal bleeding prior to the completion of the process. However, all bone matter, including marrow, remains unaffected by the transmutation. This feature extends to bone that has been removed from the body: SCP-1120 is unable to break or shatter human bone in any manner or capacity. The source of this limitation remains unknown. Discovery: Twenty (20) instances of SCP-1120 were discovered in the ██████ Museum of Natural History on October 12, 197█. Foundation listeners responded to a call on a local police blotter, reporting 'stone men' terrorizing museumgoers. Foundation personnel, disguised as police reinforcements, arrived on the scene, and, after several hours, were ultimately able to corral and subdue all instances of SCP-1120. Several city blocks were destroyed in the process and ██ casualties were recorded. Class-B amnestics were distributed via chemtrail and a cover story about an earthquake was disseminated to local news media. Eleven (11) other instances were unearthed by an archaeological dig team in [REDACTED] on March 6, 198█. Though the specimens remained dormant throughout the excavation, the careless actions of the dig team resulted in the creation of ██ more instances of SCP-1120. Reports quickly reached nearby civilians, and, in turn, Foundation operatives. SCP-1120 was contained without incident. The remaining instances were discovered in [DATA EXPUNGED]. It is highly likely that these are not the only instances of SCP-1120 that remain concealed in this way. Operatives are advised to be watchful and to exercise great caution. The following piece of graffiti was discovered scrawled on the wall of the ██████ in Pompeii. It is believed that it was left by an agent of a primitive group functioning as a precursor to the current Foundation, though archaeological evidence for this remains scant. There are so many of them. We cannot outrun them. They must be contained, before the stone plague spreads further. It has already made it to Herculaneum. There is no time. To anyone who reads this, get out while you can. I go now to provoke the wrath of Vesuvius, in the hope that a cloud of ash will bury them forever. May the gods watch over me.